Oh the memories of fingerpainting! Looks like your darling boys had a great time! We are going to be doing a stamp craft - I was going to use a stamp with the Toddler, but your boys inspired me just to use her hands!! They really look like they are having a great time! You were so smart to cover the whole table. ...loved and miss those days of fingerpainting and playdough making. Enjoy! That is fun!I kind of want to do it too,lol! My Grandson loves craft time. Looks like your kids do too. Fun! 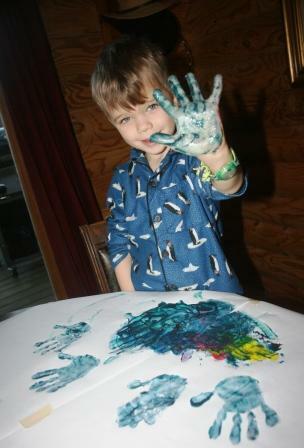 Can't go wrong with the mix of kids + finger paints + a big piece of blank paper! Fun! I have to admit sometimes I hate paint ... but the kids love it so we have to give in, right? ;) Looks like yours had a blast! 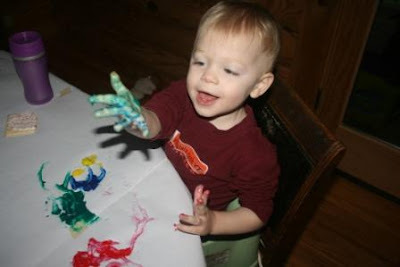 Oh the joy of little hands...oh the mess of them too, lol! 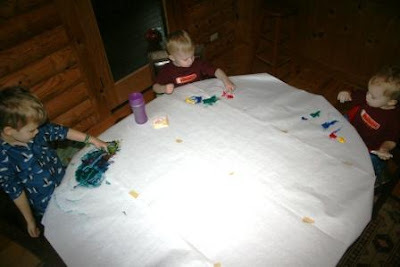 I really loved this fun activity... long ago! Lying here reading, doing puzzles, and watching movies today! Looks like fun! I love paint, on my walls that I painted. 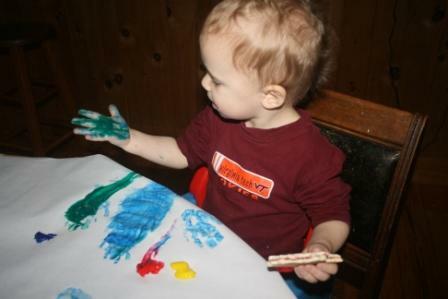 But I am not a fan of finger paint. Your boys make it look less messy. The twins look like it didn't get on their shirts. Awesome. ! Looks like so much fun :-) I think that it's important for littlies to get messy every now and then - life isn't always neat! January on my side of the world is summer, but... it has been RAINY here for quite awhile :-/ On rainy days, Joe and I either take a walk to the library across the street, to the art gallery (very kid-friendly - children can touch some of the exhibits, lie on the floor, there's a kids' area, etc). We also do lots of singing in the house and dancing, lots of hand-games... not too much else you can do with a 6 month old! I'm sure that once our winter arrives in June/July, he'll be up for some messier, slightly more independent stuff! I never tire of smiling whenever I see your header, it is so cute and never gets old to me, especially the twins on the right. Really cool pictures, will you save the artwork? I am presently taking drugs to entertain myself. And I must say it's working pretty well!!! Had the MRI last night and had to wait three hours for my appointment!!! It made us miss the school board meeting to honor Phil!! But at least it's done now! The entertainment never ends here! Lately just not as fun as yours, I miss my girls! 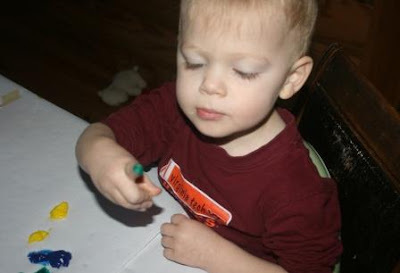 But when I get them back, I will not be quite as brave to bring out the finger paints. I have a flying indoor helicopter planned. Phil managed to knock Mary and the baby Jesus off the table with the chopper in an impromptu attack. It is dreary and boring...they make a cute mess. How fun...I just love seeing the creative things you come up with to do with your kids. They are lucky to have a Mom like you! I do remember that the girls could never grasp the concept right off of making a mess. Even with bathtub paints haha. That looks fun! Somehow my kids ended up with big smooshy brown spots all the time! Glad you are going to join me in the big clear out. It's just something that needs to be done every once in a while to keep me sane. 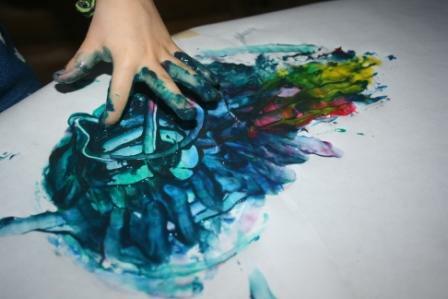 Its fun to remember the times years ago- when friends got togther and enjoyed finger paints. That looks like SOOO much fun! I need to get my stuff out & let the girls go to town. Oh boy. I'm so glad I came by today. Little kids and fingerpaints...one of my favorite combinations! I agree about January...but that looks like a LOT of fun!! Good job, Mama! I really quite like January because the craziness of december is over. I always feel rejuvenated and hope to pass that onto the kids. This year we are so busy with me back at work full time, Deaglan at school fulltime that on the weekends, I totally veg out! Love the artwork. They are so cute! It looks like they had fun!